This predates BMW's twin turbo inline six by 16? years, and offers up 60 more hp (albeit from a motor .5 L larger). Fairly impressive, even if it was a 'tuner car'. I'd love to own one of Alpina's E34 efforts someday. And the Alpina's engine only has 12-valves, not 24. ...I am jealous of your shift knob. That is a shape I love. your mom sounds like my kind of lady. is she single and/or discrete? Don't forget BMW's own 745i. It follows the M102/M106 by around ten years... Fuel consumption is the same, but power is improved over those. The naturally aspirated E34 M5 put out 310hp IRRC, even in US trim. Larger motor than the E92 328i, but still!!! 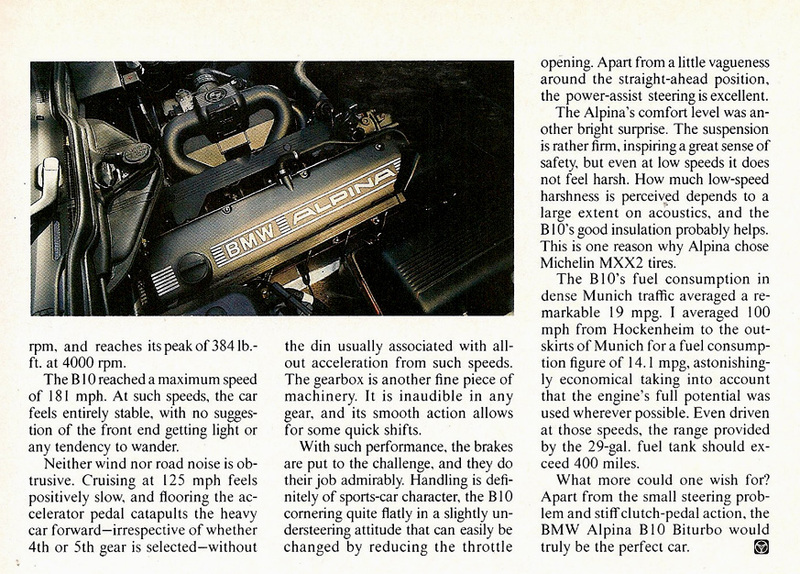 Exec Summary - Alpina made BMW turbos for the Five Series more than thirty years ago. The BiTurbo was the apex of these efforts in the six cylinder Five Series. Alpina made an earlier B10, for the E28s, as well, a NA car - and the E 28 E7s Turbo, but this was not their first turbocharging effort. This was in the days where their very survival depended on them being able to put out a car that could match or better the M5. 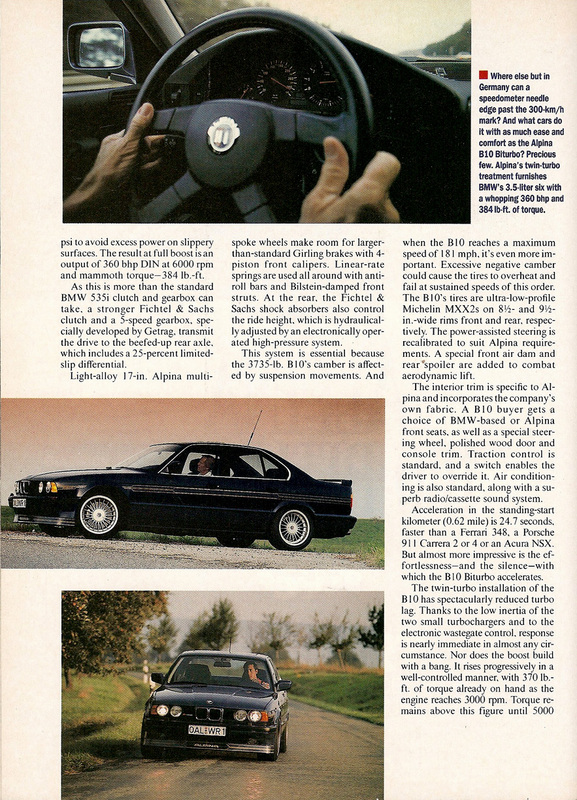 For every BMW stroke against high end tuning for the exec saloons, Alpina had a counterstroke. The 1982 Alpina e28 B7s followed the earlier turbocharged ~1978 E12 B7, a three liter turbocharged conversion that pumped out 300 HP and 341 ft lbs of torque and ran 0-60 in 5.9 seconds. Not too many of these cars exist because they were bespoke. They were expensive and rough cars, as were the E7s E28 versions. This version (~1982) used the 3.5 liter engine in the 6 series coupes and 7 series and punched out 330 HP and 332 ft lbs of torque. The E7s ran 0-60 mph at 5.8 seconds and a max speed of 162 mph, faster than the M5's 6.3 seconds and 153 mph, respectively. But the target market segment liked the E 28 M5 more than they liked these Alpinas, so in 1987 Alpina struck again - the first B10 type, based off the 3.453cc from the M535i. It had a lower HP rating, this normally aspirated engine, than the turbo versions, but it was designed for polish and not for pure velocity. Why did Alpina do this? The M5 of the day was a manual only car, so Alpina made a car very close to the M5 power rating, but equipped with an automatic transmission to compete. The E28 Alpina B10 was a supercar available only in an automatic, an answer for another thread. Which brings us up to the E34s. The E34 M5 came out in 1988, equipped with the 3535cc inline six, capable of developing 315 HP, 265 ft lb of torque, and 0-60 in 6.4 seconds. The E34 was a heavy car, 3800 pounds, and the extra HP was needed to move it well. 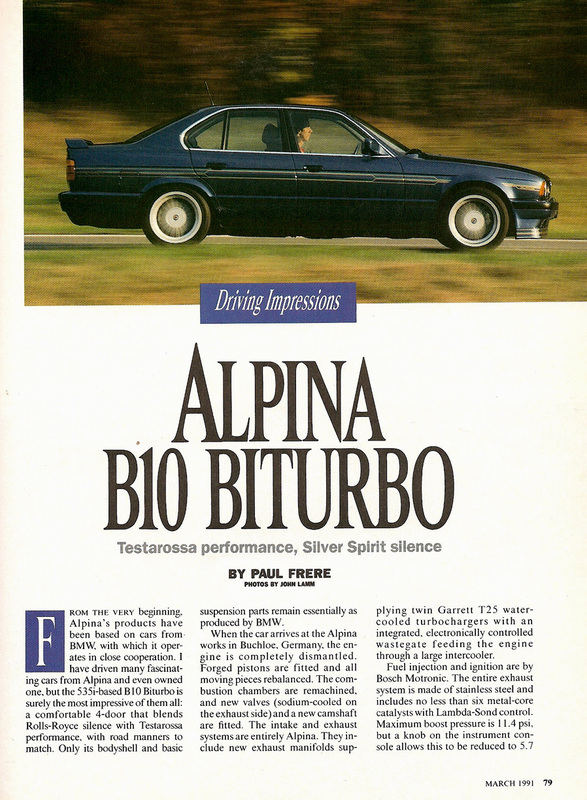 Alpina dropped their B10 E28 kit in the E34, but the new catalytic converters hurt its performance enough that they quickly moved to the biturbo set up in the B10 Biturbo in 1989. The biturbo had two smaller turbochargers, Garret T 25s, set up in parallel to eliminate turbo lag. These boosted the engine to 360 HP / and 385 ft lb of torque, and this huge heavy car could go 0-60 in just 5.2 seconds. 507 E34 Alpina B10 BiTurbos were built, and they are very highly prized. In 1994, Alpina built a B10 4.6L from the four liter V8s that became available in 1992. They bored and stroked the engine to give 340 HP/353 ft lbs of torque, not quite the same as the BiTurbo E34, but it had the Vee Eight's torque down low and drove differently than the BiTurbo. -And the BiTurbo was the fastest of them all. It was a supercar saloon. Most E39 Alpinas were based off of the V8s and V10s, so the BiTurbo represents its apex in terms of tuning with the six cylinder engine in the Five, at least in terms of gee whiz outcomes and volumes shipped. Good. Sometimes the only way to deal with knuckleheads is to have the lawyers duke it out. Bodykit and stickers are not very good looking. Engine is still awesome though. I'm sorry, but Alpina's need those traditional stripes. It's not a bodykit, it's just a front bumper which I what I don't like...makes the car look slackjawed. I wish they at least used the M Technic skirts and rear apron.